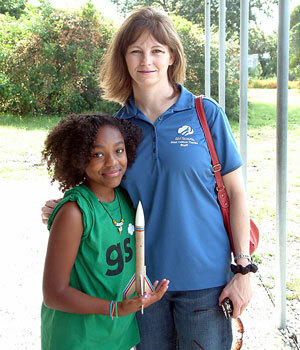 Rocketry Planet reports that there have been three Girl Scout who have been national winners at the Reach for the Stars National Rocket Competition. Michelle Jorgensen of Colorado was the first Girl Scout to win nationally in the Reach for the Stars National Rocket Competition. She competed in 2009 with Troop #337 at the Challenger Learning Center of Colorado under competition host, Tracey Tomme. She was preceeded in 2010 by Azriel Clary who competed during a camp-in lead by Pathway Collaborations Manager, Patricia Hemenway, with the Girl Scouts of West Central Florida. Taylor Goodwin competed with her class at Penrose Elementary School, Penrose, Colorado under teacher, Michael March. Resulting from these victories, Girls Scouts across the country have turned out to compete in the fifth annual Reach for the Stars National Rocket Competition. Thanks to Girl Scouts of Connecticut Program Initiatives Coordinator, Ellyn Savard, and a Science, Technology, Engineering and Mathematics Education Institute education grant, over 100 Girl Scouts from Connecticut were involved in this year's competition. Read more here. Do you know any girls interested in building rockets?